Cowboy Bebop is one of the best anime series to come out of Japan in the '90s. Director Shinichiro Watanabe collected designers, writers, animators, composers and voice talent that were all at the top of their respective fields and brought them together in a harmony worthy of the musical title. Once upon a time, in New York City in 1941...at this club open to all comers to play, night after night, at a club named "Minton's Play House" in Harlem, they play jazz sessions competing against other. Young jazzmen with a new sense are gathering. At last they created a new genre itself. They are sick and tired of the conventional fixed style jazz. They're eager to play jazz more freely as they wish then...in 2071 in the universe...the bounty hunters, who are gathering in the spaceship "Bebop," will play freely without fear of risky things. They must create new dreams and films by breaking traditional styles. The work, which becomes a new genre itself, will be called... "Cowboy Bebop." When humanity leaves Earth behind and heads to the stars, crime and violence follow. 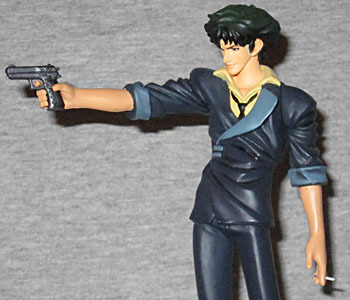 Spike Spiegel is one of the many bounty hunters (called "cowboys") prowling the galaxy, trying to keep a lid on things. He's one of the best in the business, working with his partner Jet (an ex-cop) to track down the baddest bad guys in the universe. When Cowboy Bebop made its way onto Cartoon Network's [adult swim] program, its popularity soared. Manga, busts and statues all got imported, but so far only one lonely little action figure. Spike stands 6" tall, and is sculpted in his usual rumpled blue suit. The large lapel falls across his chest, the collar of his yellow shirt pokes out at the neck, and it's unbuttoned as far down as his loosely knotted black necktie. His sleeves are rolled up to his elbows, and the cuffs of his pantlegs are turned up (or possibly tucked in) above those clunky, oversized shoes. Even McFarlane would be jealous of how little articulation Kaiyodo/Xebec has seen fit to include. Lacking even the hips necessary to qualify as an "action" figure, Spike moves only at the shoulders, neck, and elbows. Not even a waist! For a guy that's a master of jeet kun do, he's pretty immobile. The articulation really only allows for two poses: pointing his gun or holding it in the crook of his arm. Not exactly a wide range, there. Who creates a figure of a kung-fu action hero that can't move? Be like water, Spike, not like stone. In addition to the gun, Spike comes with what is easily the smallest accessory ever packed with a figure: a miniscule cigarette that fits into a tiny hole between his fingers. Because the damn thing's so small, Kaiyodo gives you three of them (they're in a tray hidden behind the base in the packaging). It's nice to see a company thinking ahead. Since you can't pose his legs, Spike comes with a base to help him remain upright. 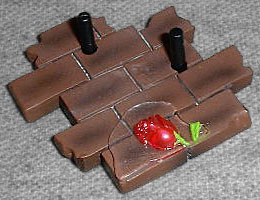 Based on one of the show's strongest images, the base is a section of brick sidewalk with a rose lying in a puddle. 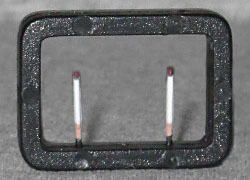 The puddle is molded from clear plastic and is a seperate but non-removable piece. There are two long pegs that fit into Spike's feet, and the toe of his boot fits with one of the puddle's curves. The likeness of the figure is dead-on, and the accessories are fun. With a bit more articulation, he'd be great. As it is, he's only going to appeal to fans of the series who can overlook his glaring shortcomings. 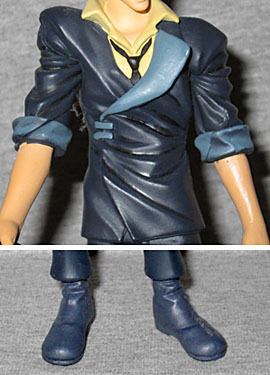 If Kaiyodo releases more Bebop figures in the same style, though, his rating will probably rise.